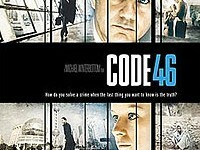 "Code 46" is a love story set in an eerily possible near-future where cities are heavily controlled and only accessible through checkpoints. People cannot travel unless they have "papelles," a special travel insurance. Outside these cities, the desert has taken over and shanty towns are jammed with non-citizens - people without papelles whose lives are severely restricted. William (Robbins) is a family man who works as an insurance investigator. When his company sends him to another city to solve a case of fake papelles, he meets a woman named Maria (Morton). Although he knows she has been creating the forgeries, he falls completely in love with her. He hides her crime and they have a wild, passionate affair that can only last as long as his papelles: 24 hours. Back home, William is obsessed with the memory of Maria. He tries to see her but is refused the necessary papers to travel. Desperate, he uses one of the fake papelles he kept from his investigation. 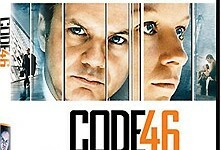 He eventually tracks her down, only to discover she has been accused of a Code 46 violation.